The former Seneca Army Depot is home to the world’s largest herd of white, whitetail deer. Often called the ‘ghost deer” this unique color phase of the normal brown whitetails are sure to excite everyone who has the opportunity to see them. When added in with the colorful military and civilian history of the depot, it makes for a rewarding experience found nowhere else on our planet. Management of the white deer within the former Depot increases the proportion of deer exhibiting the trait. 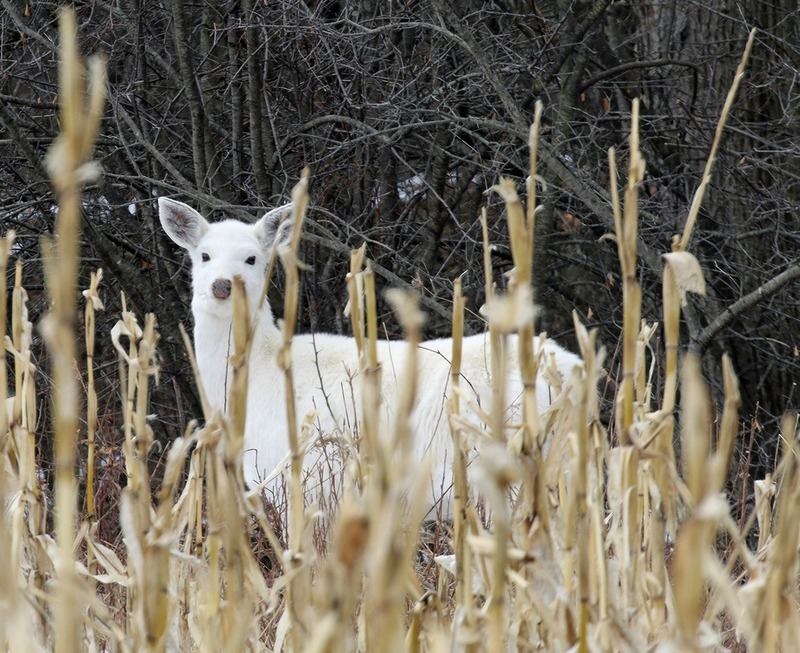 In an unprotected environment, white deer are usually easy prey for predators or hunters. 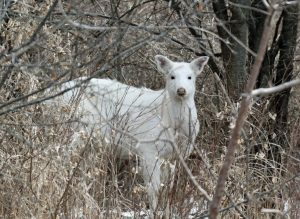 The limited predators and controlled hunting on the former Depot have allowed the white deer to interbreed and increase in numbers for more than 60 years. 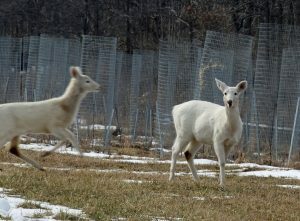 Other white deer herds exist in protected environments, including white fallow deer in Ireland, but none of th ose herds are as large as the white, whitetail deer of the Depot. 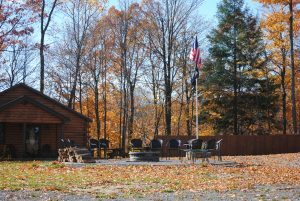 Combine your visit to the White Deer Sanctuary with accommodations at Cayuga Lake Cabins, located a short drive from Seneca Army Depot. Call 607-738-9288 today to book your stay! The purpose of our trip was to celebrate our 25th wedding anniversary. We’ve been to the Finger Lakes numerous times but always stayed in a hotel near Lake Seneca. 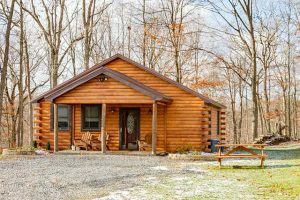 This time we decided to pick a cabin and luckily found the Cayuga Cabins. They are impeccably clean and the perfect size for a couple or small family. The modern amenities make you feel right at home. We will most definitely stay at the cabins again. By far the nicest cabins we’ve ever stayed in! Great job Cheryl and Jim!! Experience the best Finger Lakes cabin Rental the region has to offer with our all-inclusive Stay & Tour package. STAY, RELAX, REWIND, AND LEAVE THE DRIVING TO US. Venture beyond the confines of a hotel. 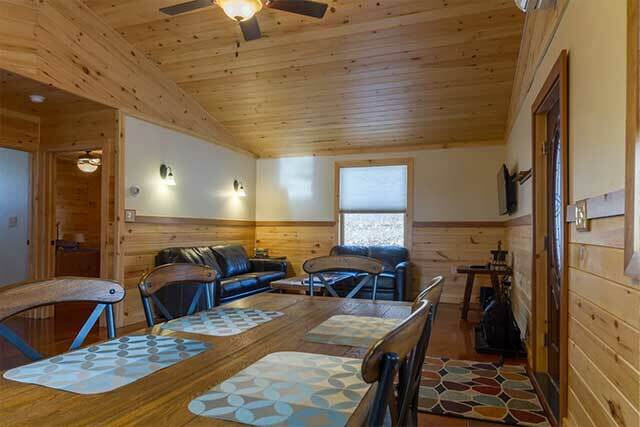 Experience two nights’ accommodations for 4 guests in our spacious and modern log cabin vacation rental property. 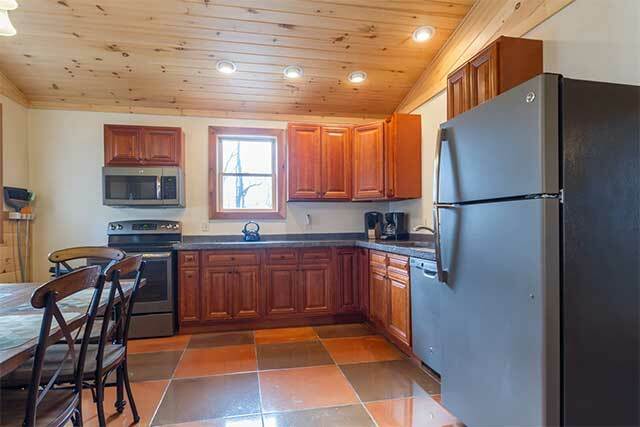 Located in a private setting on the west side of Cayuga Lake you will enjoy all the amenities of home away from home. 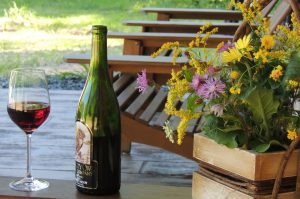 Our customized Cayuga Wine Trail Tour (17 wineries to choose from) also can include local craft beer, hard cider and cheese tastings, a visit to a distillery and sightseeing stops. You set the itinerary or we’ll suggest one for you! Make a memorable Finger Lakes Getaway – Package price includes taxes and fees; tour driver gratuity is additional. 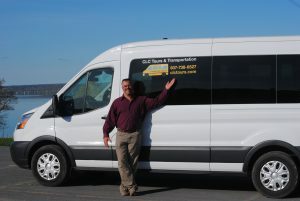 Guided Cayuga Wine Trail tour lasting up to 6 hours in our roomy and comfortable 14-passenger van. We provide bottled water and light snacks and plenty of storage space for wine trail purchases. 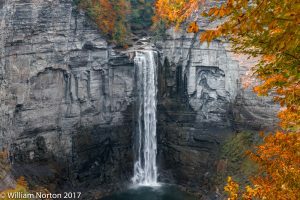 Area attractions include Seneca White Deer tours, Women’s Rights National Historical Park, Del Lago Casino, Waterloo Premium Outlet Mall, Corning Museum of Glass, Hiking and gorge trails at Taughannock Falls, Robert Treman, and Watkins Glen State Parks, Ski Resorts, Lake Fishing, Antiquing & Shopping, and many excellent dining options. 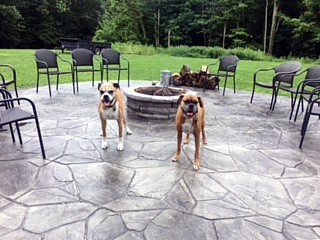 Bring your furry friend on your getaway – Cayuga Lake Cabins and the Cayuga Lake Wine Trail wineries are dog friendly too! Call 607-738-9288 now to book your stay. 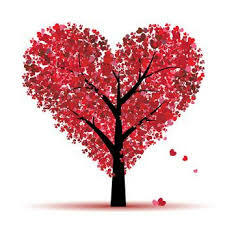 Go to http://cayugalakecabins. 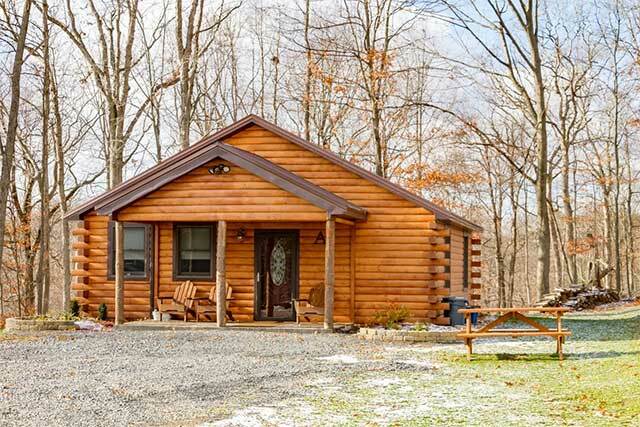 com for links to our Finger Lakes Cabin Rental photo gallery, full descriptions and reviews. Thanks to blogger Aurora James for creating this post. Aurora believes there are no bad dogs. She created DogEtiquette.info to share her dog training tips and advice to dog owners everywhere. When planning vacations, people often want family and friends to tag along, so it comes as no surprise that dog owners want to bring along their dogs too. After all, many people consider their dog to be a part of the family and a best friend. If you’re planning a trip with your dog, there are some important considerations to make and steps to take to ensure your dog is safe and comfortable on vacation. You should first consider how much traveling your dog can handle. This will help you choose a location. If flying is out of the question, some vacation spots may be eliminated. In order to fly, your dog should be the appropriate age and in good health. Also, certain breeds cannot travel in cargo, such as snub-nosed dogs like pugs. If you’re on a tight budget, consider that there are fees for flying with pets. Flying can be pricey, but that doesn’t mean all dogs are up for a road trip. Before taking her on a long trip, ensure your dog does well with shorter drives. Are you willing to plan ahead for every stop? 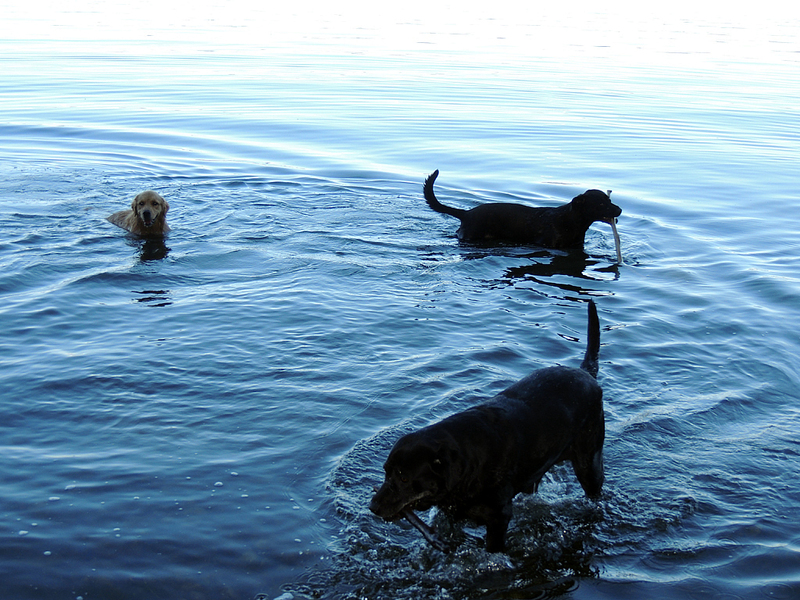 You’ll need to locate rest areas for your dog and dog-friendly hotels. Also, consider what you would do with your dog if you need to stop for food. Once you come up with the distance you can travel with your dog, determine the type of vacation your dog will enjoy. You have to put her interests first. For example, if your dog doesn’t enjoy the great outdoors, a camping trip may not be a good idea. 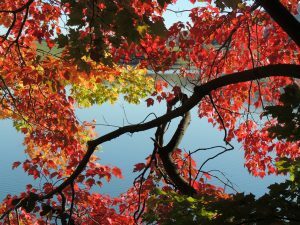 On the flipside, if she loves going for swims and rolling around in the leaves, a stay in a lakeside cabin with an itinerary full of outdoor adventure is a great idea. 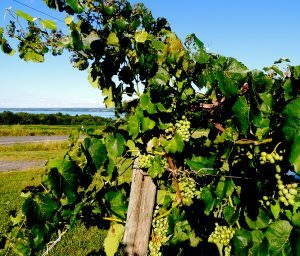 For example, New York is home to Cayuga Lake Cabins, which is surrounded by vineyards and forests, so you can hike, kayak, fish, take a wine tour, and more. And best of all, it’s dog friendly. Before any trip, take your dog to the veterinarian for a checkup to ensure she’s in good health and up to date on vaccinations. Ensuring you have all of the necessary pet supplies is also essential. Bring all medications, such as flea and tick prevention (especially if you’ll be spending a lot of time outdoors), a crate, toys, leash, and more. Have a health certificate and medical records on hand, as well as a record of rabies vaccination and up-to-date ID tags. Follow the rules of etiquette when traveling with pets. 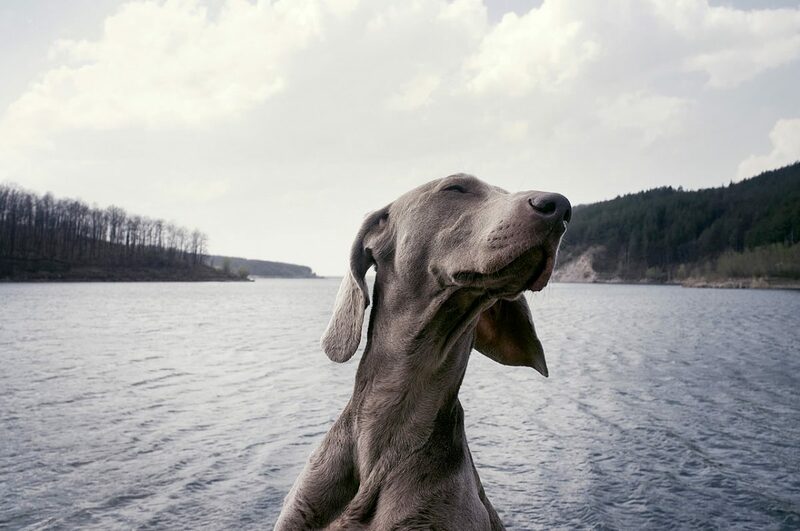 Have your dog groomed right before the trip, and bring along supplies to help her stay clean. For example, pack wipes to clean dirty paws after walks and a spare towel for a wipe down. Don’t forget to bring dog poop bags so that you can properly clean up after your dog. In addition to distracting the driver, an unrestrained dog that’s freely wandering the vehicle is more likely to be injured in an accident. Keep your dog safe in a car by restraining her in the backseat with a pet harness/safety belt, travel crate, pet vehicle seat, or pet barrier. Don’t allow your dog to stick her head out the window, as this can cause ear damage or lung infections. Stop every two to three hours for her to exercise and use the bathroom. When leaving for a trip, be sure to double-check your home security to prevent break-ins while you’re away. A security system and wireless cameras prevent break-ins and give you peace of mind. Be wary about how much information you give on social media as well. “There have been documented cases of thieves using platforms such as Facebook, Instagram and Twitter to discover when their victims will be gone,” warns Redfin. Instead of hiding a spare key, give it to a trusted neighbor. Lastly, become knowledgeable on why and how criminals break into homes. If you consider your dog a member of your family or your best friend, you may want to bring her along to enjoy your vacation with you. 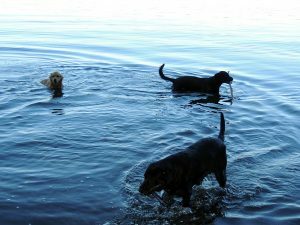 However, a vacation isn’t the same as a short trip to the dog park; you’ll need to adequately plan for a pet-friendly vacation. Following some advice on planning and preparing for a trip with your dog ensures that the experience is enjoyable for everyone, including you, your dog, and other travelers. This is the best HomeAway place we have stayed by a mile! 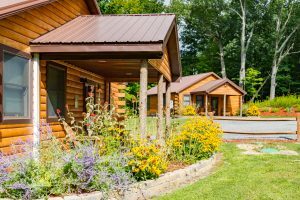 The cabins are fantastic, and fully stocked with anything you could possibly need (there is even fire wood for the fire pit for you to use). All furniture is new and comfortable. The location is unbeatable (right on the wine trail). And the owners are so nice and welcoming (they leave a binder with all suggestion, coupons, contact info, etc., that you could ever need in the area). We will never stay anywhere else in this area! Of note, the cabins are right next to one another in a private area, so if both are available you can stay here with bigger groups too! There is even a common area fire pit with tons of seating inbetween the two cabins! 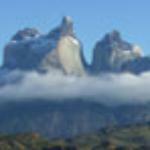 In summary: the owners are amazing, the cabins are luxurious and comfortable, and the location is unbeatable! Cayuga Lake Cabins Labor Day Vacation Rental Special – 25% off! Stay September 4-8, 2017, pay for 3 nights, get 1 night free! 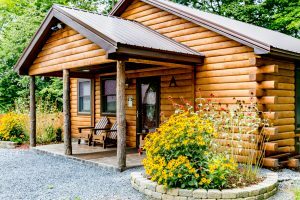 Contact us to book your stay in our log cabin vacation rental! 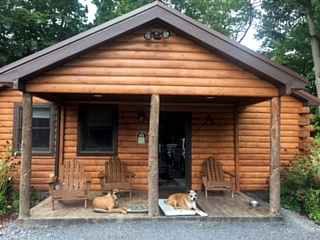 Bring your dog – the cabin is pet friendly. Celebrate Labor Day with a relaxing Finger Lakes Getaway. Call 607-738-9288 to book your stay! 2 Queen sized bedrooms with dresser, amoire, room darkening shades and ceiling fan. Accommodates up to 6 with the pull-out sofa sleeper in the living room.